[miau] If you like paylines, then you’ll love Cashapillar! The online slot machine game by Microgaming boasts an impressive 100 of them, making the strategy of activating the paylines a big part of play. Just to make space for it all, the board size has been increased from 15 to 25 spaces, giving each spin more action as well. There’s a very busy setup with a lot to keep track of. Don’t let the interface intimidate you; it’s really very simple and fun to play. 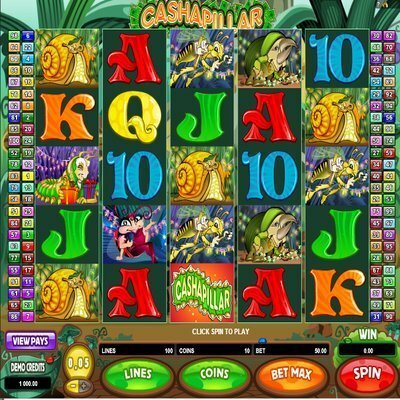 Cashapillar is great fun for the casual slot player who doesn’t miss big progressive payout jackpots. Instead, it has a vast grid of payouts making virtually every pull a sure winner. This isn’t just like shooting fish in a barrel, this is like having the shotgun bolted into the barrel so you don’t miss. The maximum jackpot payout is $120,000 , which is considerable. You can’t ask for better than having an equal shot at it every time you spin. Cashapillar’s graphics use Poker playing card symbols including aces, jacks, queens, and so on, along with cute cartoon drawings. These work together with the Wild symbol and the Multiplier symbol, increasing payline hits even for crossed symbol lines of different types. But the machine really goes crazy when the Cake symbol hits – it takes off into a cycle of 15 free spins, and not only that, but winnings are tripled during free-spin time. While the coin denominations seem small, as they’re only one-cent and two-cent, that’s because there’s 100 paylines to bet on. Betting a simple dollar per spin ensures maximum payout potential. Bet up to the maximum of 10 coins per payline for a $10 spin on one-cent coins or $20 per spin with two-cent coins. Now that it’s put that way, it doesn’t sound so small-ante, does it? Big buy in, big prizes! To get the max payout, the machine has to hit the Cashapillar Wild symbols at every reel position with maximum paylines turned on during free spins. When the Cashapillar Wild symbols line up without free spins, it pays a mini-jackpot of $40,000. This payout is still bigger than most online slot machine game payouts. Cashapillar isn’t one of those slot games that rely on fancy graphic animations, loopy sound effects, or flashing jazz to make the game exciting. Instead, all that extra effort goes into game play, because it takes a lot of processing power even on today’s devices to keep track of that many slot reels and paylines. The high-rolling fun comes from the strategy of watching the machine’s patterns and betting paylines strategically. The background music and effects are simple, yet satisfying. With this many paylines and symbols, there’s a lot to keep track of. The Cashapillar Slot game has much deeper play that most slots. It’s surprising how addicting it is, because it’s so much more interactive than most slots. It can grow to be a huge time sink, not that you’d mind killing the last two hours at the office Friday afternoon on it. It can provide hours of idle stimulation with the prospect of hitting a vast sum per game, any and every time you sit down to play.